I have done freezer paper stencil before with the hobo dance bag tutorial and loved it. It’s so much fun and easy to do. I wish I was better at coming up with designs for t-shirts then I would do this all the time. I thought these would be cute shirts for the girls since we will be going to the beach this summer. Unfortunately it won’t be the Hawaiian beaches. But a beach nonetheless. 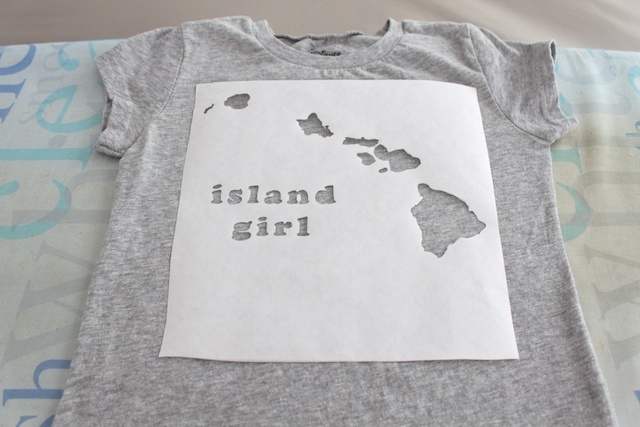 If you are having a beach themed party, a luau or lucky enough to have a trip to Hawaii this year, you’ll want to use my patterns to make shirts for the kiddos. 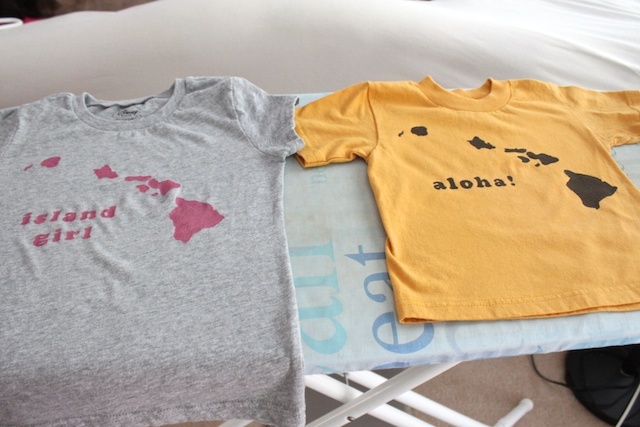 It’s a super cheap way to make your own shirts. I found these t-shirts at the Dollar Store, yes, they had toddler sized shirts. If you make something inspired by Simply Modern Mom, please upload pictures of it to our Flickr group to show it off to everyone. You may be featured on Simply Modern Mom. 1. Prewash shirts before painting them. Then print out the patterns you want to put on the shirts. 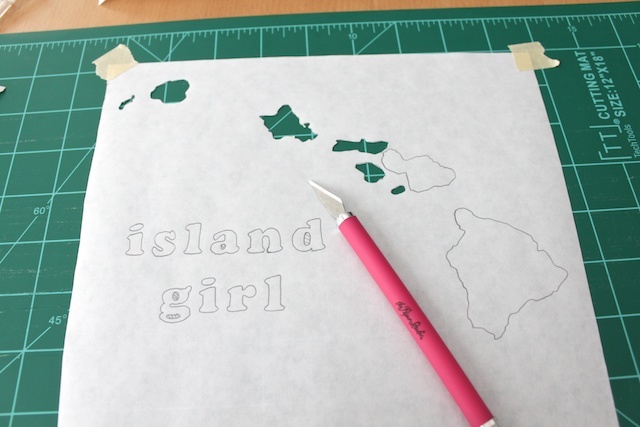 I made three PDF patterns for you to use the island girl, island boy or aloha shirt. 2. Place a piece of freezer paper on top of the pattern (shiny side down and the dull side of the freezer paper up). Tape the freezer paper in place if you need to. 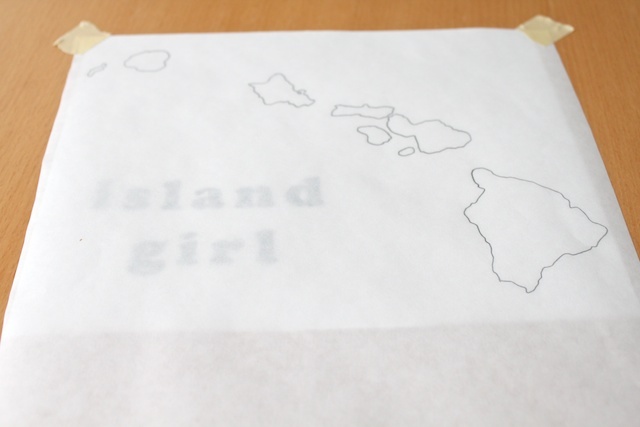 Then trace the islands and words. 3. 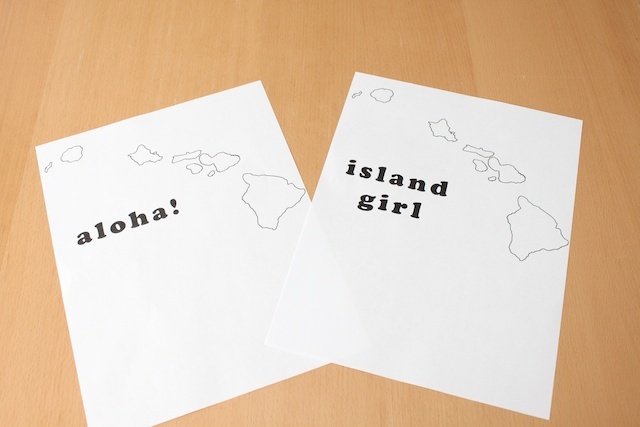 Place the freezer paper on top of the cutting board and cut out the islands and letters. Remember to save the little holes that are insides letters “A”, “D”, “G”, “O”, “B”. You will need to iron those parts on the shirt. 4. 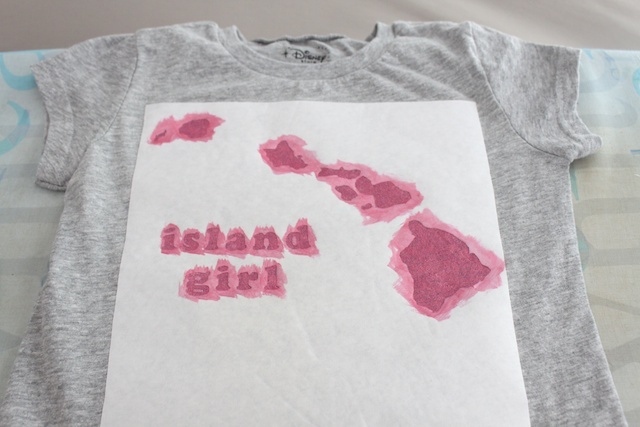 Place your stencil on top of the shirt centered. 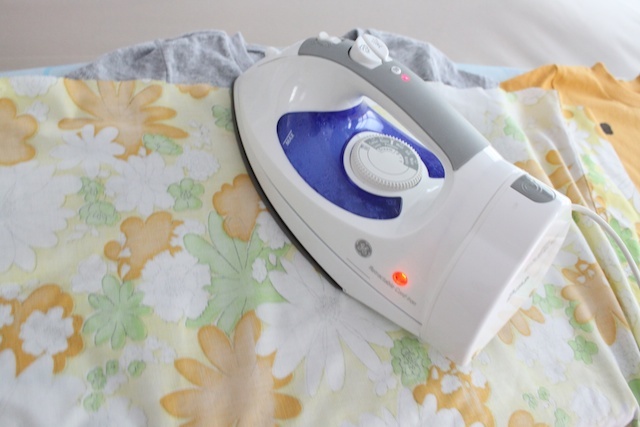 Have your iron on high/cotton without steam. 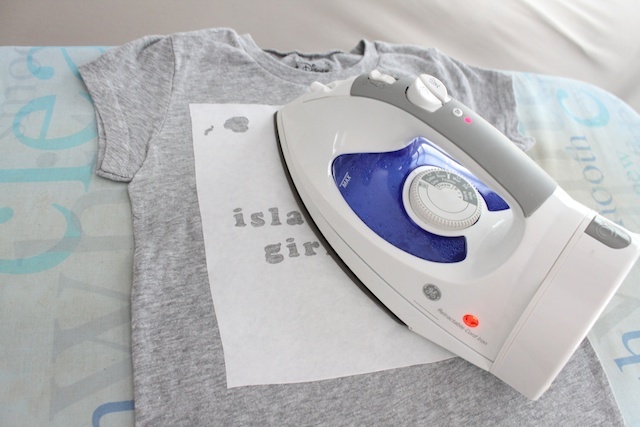 Iron the stencil onto the shirt with the shiny, slick side of the freezer paper down. The stencil should stick to the shirt. Make sure you get the edges well so the paint doesn’t leak. 5. Place the holes inside those letters from step 3 and iron those in place. 6. Once all the ironing is done, paint with a foam brush. Read the paint instructions to see how many coats and how long to wait between coats. I usually do 3 good coats of paint and wait 20-30 minutes between coats. Then allow the shirt to dry overnight to 24 hours before sealing it. 7. Peel off the stencil, don’t forget the little pieces inside the letters. 8. To seal the paint, place a cloth on top of the shirts and iron over the paint on high heat with no steam. And done! 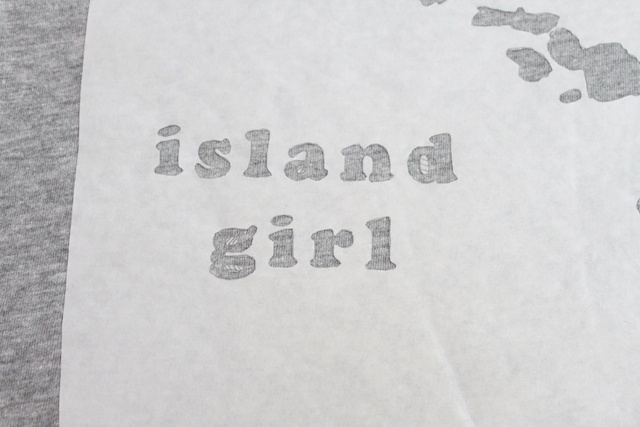 » Tell me… What kind of designs will you do with freezer paper stenciling? Don’t forget to stop by The Salty Pineapple as Nikki has to tutorial on how to make candy leis for May Day! Can you tell we are both struggling to make leis without tropical flowers? Oh how I wished I still lived in Hawaii. So cute. I love your design! I really love this and bookmarked it for my own projects. Did you layer something in between the front/back of the shirt before painting? Was there any weird residual left from the stickyness of the freezer paper or did it go back to being totally soft cotton? Super cute and do-able. i did layer a piece of paper inside the shirt while i was painting but none of the paint actually got onto that paper. and the freezer paper didn’t leave any residue. the shirt was back to normal when the paper came off. have fun with it! you’ll love it! Awesome! Thanks for the response – Your technique really looked pretty seamless and am glad to hear it didn’t leave residue. Well done! Oh my gosh those are so cute! Thank you so much for the stencil, I’ll be spreading the word. can you re-use the stencil? Haven’t tried to reuse the stencil. But I would say probably not since it rips sometimes when you peel it off the shirt. 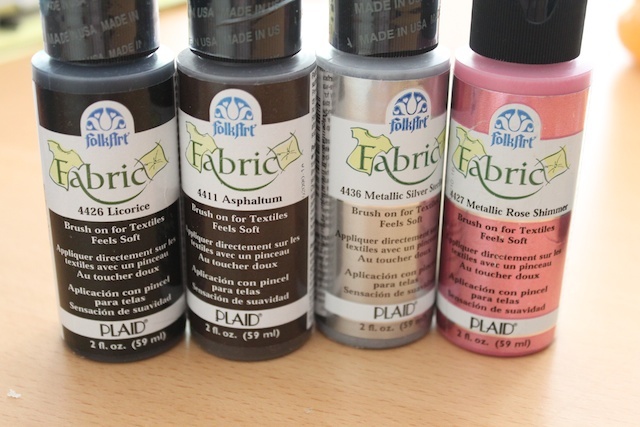 can this stencil be used on other materials than fabric? maybe wood, or your walls? I miss Hawaii too! 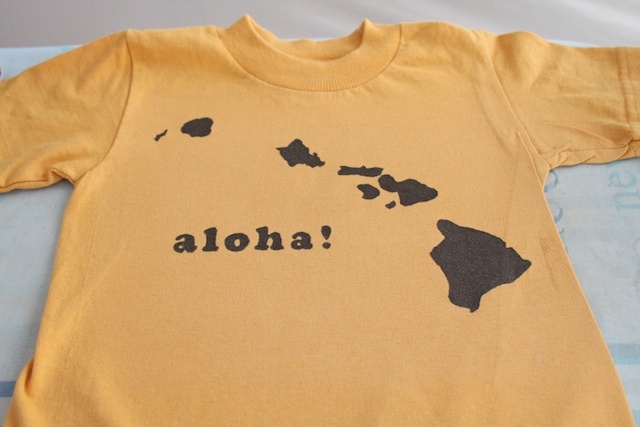 Nui ko’u aloha ia Hawai’i! C’mon by my blog and take a look at what we are doing.